I would like to tell you a story. 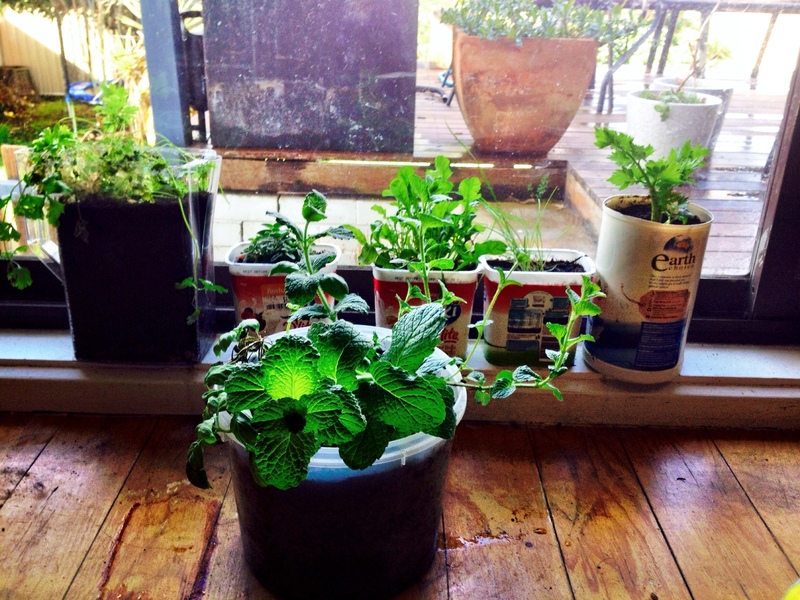 This year I decided to grow an indoor herb garden through winter, and I also decided to try to grow things from seeds. To say I haven’t had much success with growing things from seeds in the past would be an overstatement, but I have seen other people do it, and there is something very cool about watching seeds sprout and grow, so I figured I would give it another go. Back to my story…. after about a month, all the seeds had started to grow. I was so excited about these little babies that I showed them off to everyone. I proudly showed them my mustard, sage and thyme. One day, one of my obviously-far-more-knowledgeable-about-herbs friends came over and looked at my thyme and then looked at me and said, “um, I don’t think that’s thyme”, to which I replied “um, well it has to be thyme, that is what I planted in the pot, see, that is what written on the side”. She asked where I had gotten my soil from, and I explained that it was actually my compost from my beautiful compost pile that I had successfully cultivated since in Autumn. I picked up the pot and after a closer inspection my friend said, “I’m pretty sure that is a tomato”. At this point I took a good look at my thyme, and after a moment I had to agree with her. 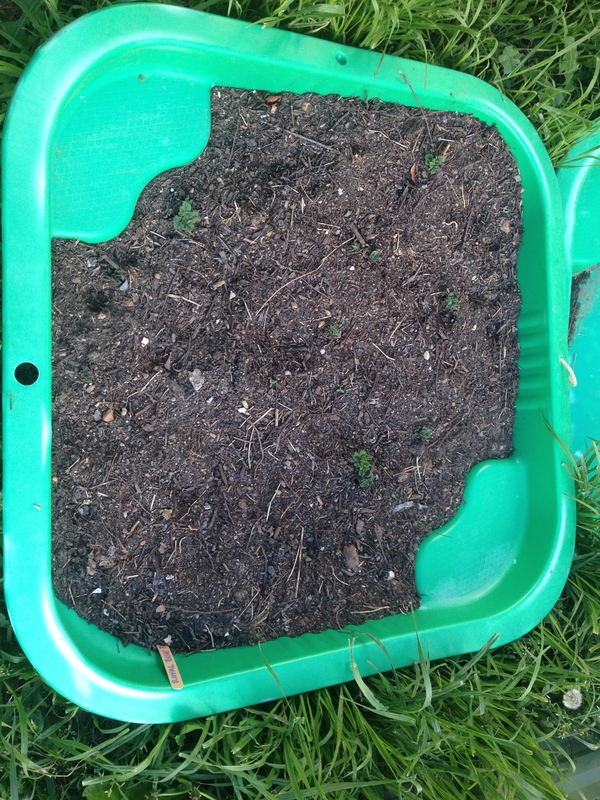 As it happens I didn’t have any success with the thyme seeds, but my compost had successfully grown a tomato. I have named it “Not-thyme-tomato”. The End. 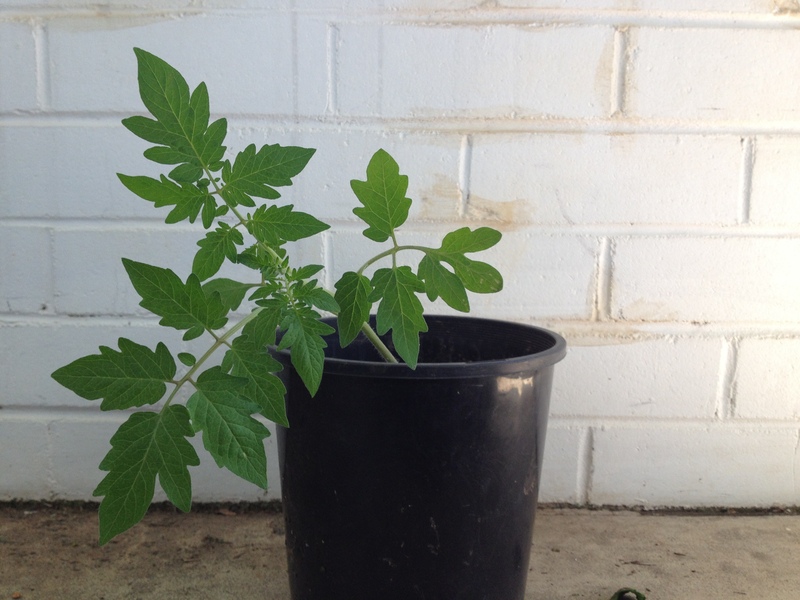 Here is the lovely not-thyme tomato, she will be going into the garden once after Melbourne cup day which is when we are guaranteed to not get any more frosts her in the Berra. The point of telling you this story is not so much for you to laugh at my dodginess (although please do), but more to demonstrate just how awesome nature is. Even with the dodgiest of gardeners in charge, you take some healthy soil, some water, some sun and you will get a plant. Perhaps another point to take from the story is that you may not want to have any expectation of the gardening outcome (i.e. expectation that you will produce thyme from your thyme seeds) as you may end up with a different result (i.e. tomato)? Let me give you another example of how awesome nature is. 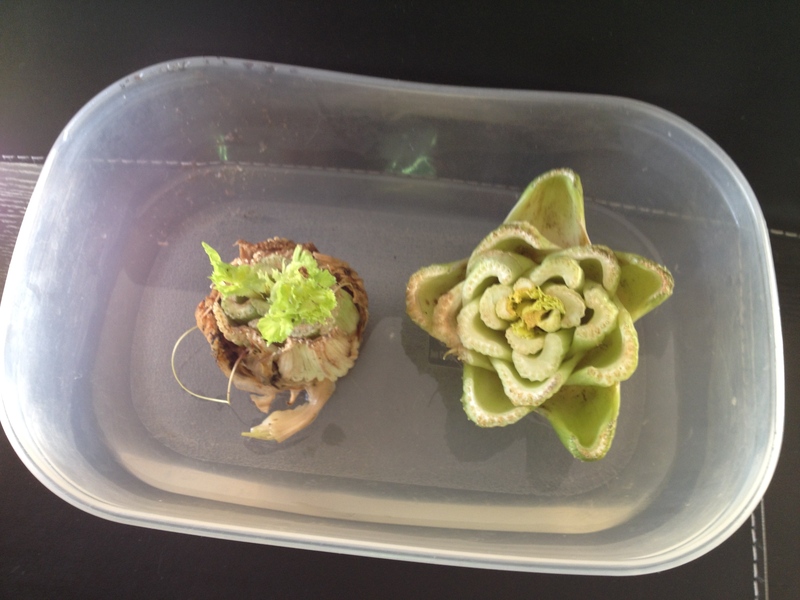 I’m sure that you are aware that you can grow fruit and vegetables from the seeds contained within them, but did you know there are a bunch of vegetables that will re-grow themselves from their scraps? Talk about recycling and sustainability! Awesome. According to an article on the “ wake up world website” there are 16 fruits and veggies that fall into this category. The coolest, as far as I am concerned is the pineapple, apparently you can grow a pineapple from the top spiky bit. Yep, awesome. I will definitely get to all 16, but for now I have give celery and potatoes a go. Let me run you through how simple this is. You just put the end bit (that you would usually throw away) into some water for a couple of days or a week (or however long it takes you to get around to the next stage) and it will start to sprout mini celery leaves. 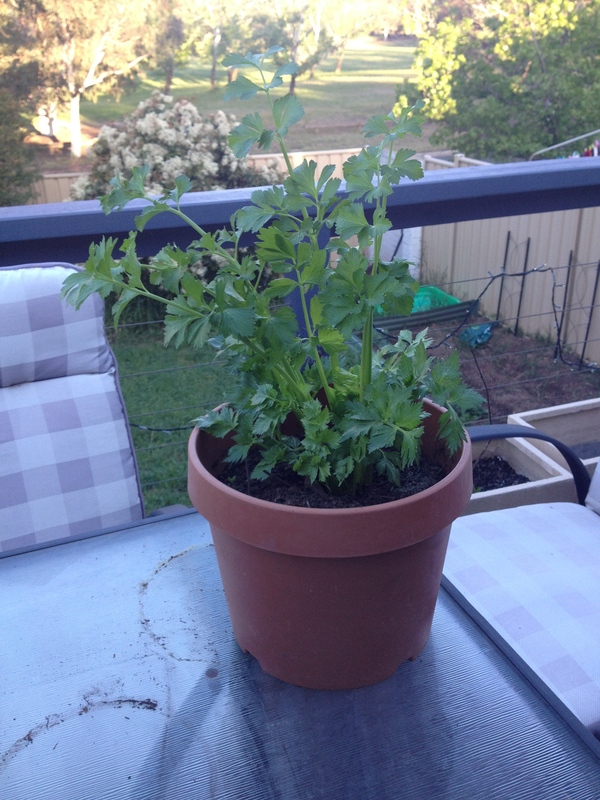 When you are ready, put the little mini celery into a pot or into the ground if you have a garden bed. That’s it, celery will grow. Awesome. Photo evidence below. With the potatoes, you just need to leave them until they have those little sprouty things coming out them. Then you can cut them up into smaller pieces, just make sure any piece you are planting has one of the sprouty things on them. Then they are ready to plant. Something I also found out recently is that you don’t have to plant potatoes into the ground. You can grow them in pots, in an old tyre, or even in a hessian sack. 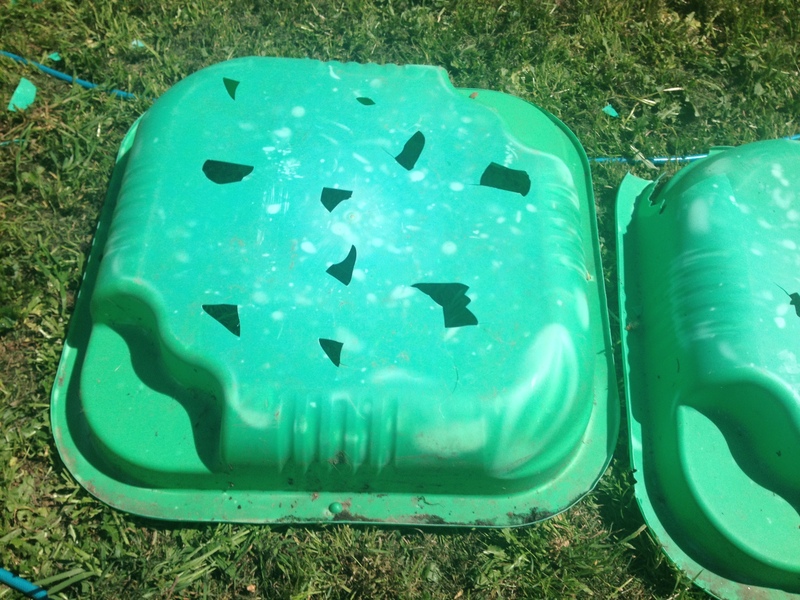 I decided to turn my son’s old plastic wading pool, which was broken, into a home for potatoes. I just took to the bottom of it with a pair of scissors, (resembling that scene from psycho), and made some holes in the bottom, chucked in some soil I bought and planted the potatoes. That took me all of about 10 minutes. I planted them about 3 weeks ago and they are already sprouting. Awesome. Photo evidence below. One thing to note, and yet another reason to buy organic, is that you may not be able to re-grow potatoes from ones you buy at the supermarket as they are often sprayed with something called Chlorpropham which prevents them from sprouting. Poor sterile potatoes 😦 . Here is a cute little video I that shows a young girls experiment with growing sweet potatoes from sweet potatoes, and the difference in shop bought vs market bought vs organic. The benefits of growing your own organic produce are many. You’ll save money. You’ll get awesome nutrition from eating fresh and a naturally produced food. If you can get stuff into the ground and/or build compost, you’ll be helping to save the soil by reducing soil erosion and putting nutrients back into the soil. And lastly, you will reduce your carbon impact and therefore contribute to saving the earth. All that, just from growing a few veggies. Awesome. 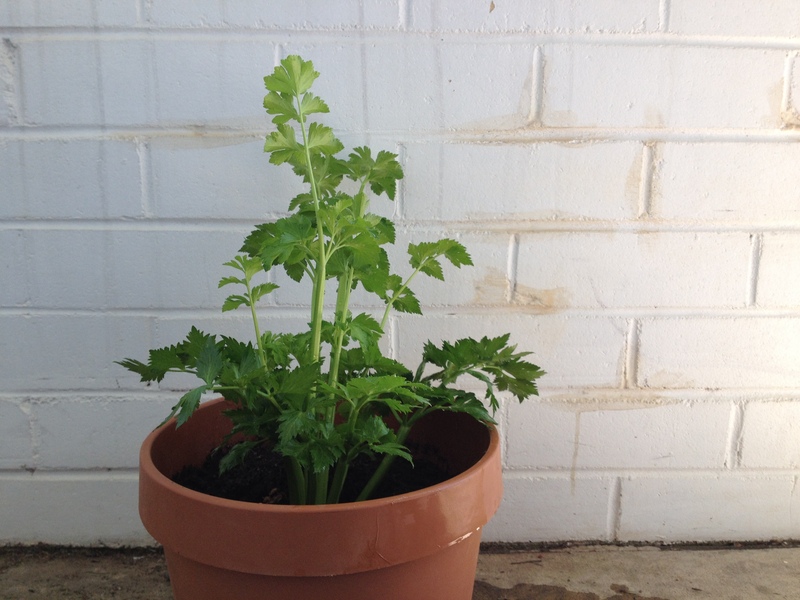 Categories: Information | Tags: backyard garden, growing celery, growing potatoes, growing potatoes in a container, how to grow celery from scraps, how to grow food from scraps, organic food | Permalink.